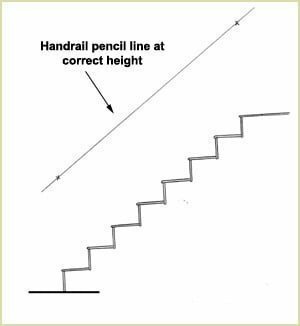 If your staircase is wider than 1m then you need to fit wall mounted handrails. 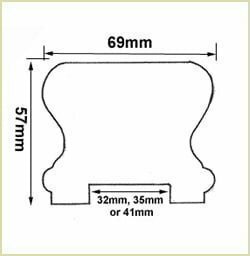 This is done by fitting either mopstick handrail or pigs ear handrail. 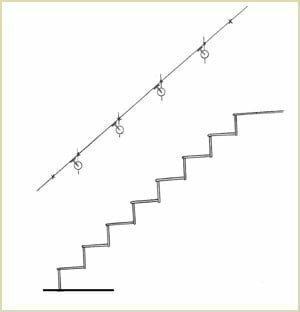 How High Should I Fit My Handrail. 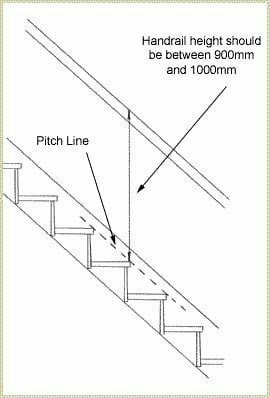 In all buildings handrail height should be between 900mm and 1000mm measured to the top of the handrail to the pitch line. See below. 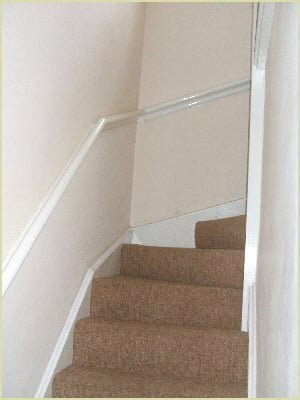 With your mopstick or pigs ear handrail you should try and match the height to the top of the handrail that is already on the staircase. 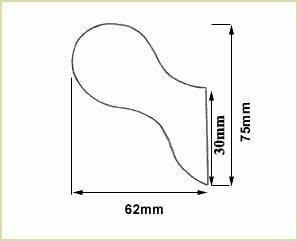 If you allow 50mm for the thickness of the handrail you need to measure up vertically at least 850mm from the very front of the bottom tread and the very front of the top tread. 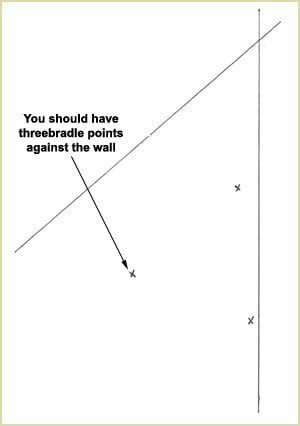 Put a pencil mark at these points. 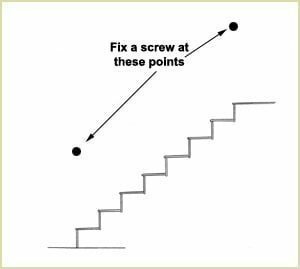 You should then fix a screw temporarily into the walls at this point. 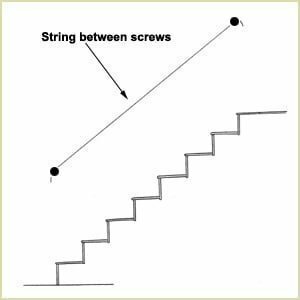 Stretch a string tightly between these two points. 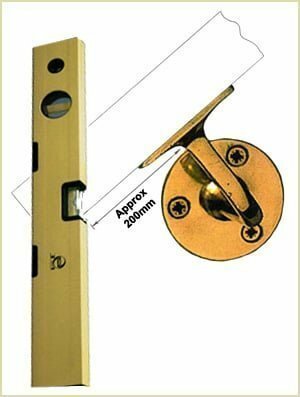 Check that the height is correct for all the steps and adjust one of the screws up or down if necessary. 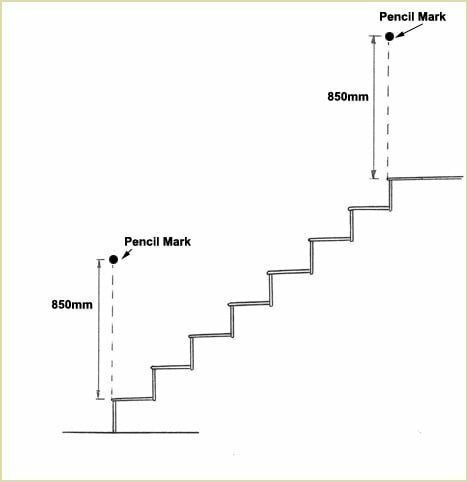 Mark on the wall every 500mm so that you can use a straight edge to join all the points. You can now remove the screws and string leaving a pencil line at the correct height along the wall. 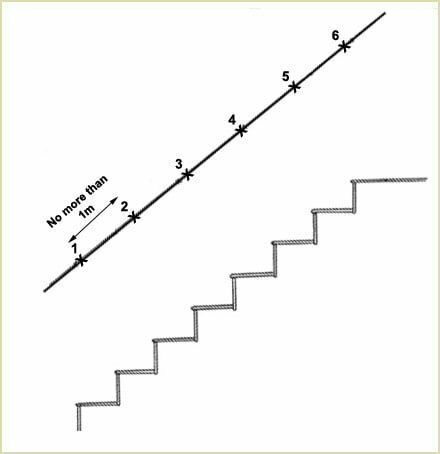 Place a long straight edge and a level against the second riser to mark an intersecting vertical line. 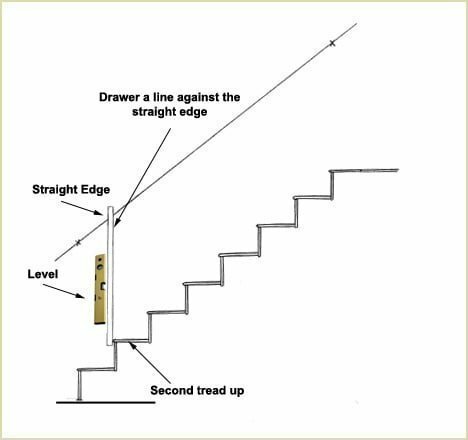 Draw a pencil line against the straight edge and then repeat the process but for the penultimate riser at the top of the staircase. You now have two intersection lines that mark the bottom mopstick bracket and top mopstick bracket. 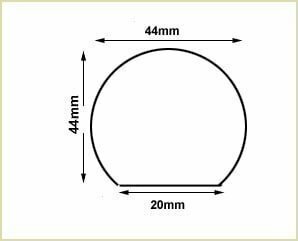 Divide the remaining distance between the two marks so that the brackets are no further than 1m apart. It is normal to have two more points in total.You will probably have four marked positions for four mopstick brackets. 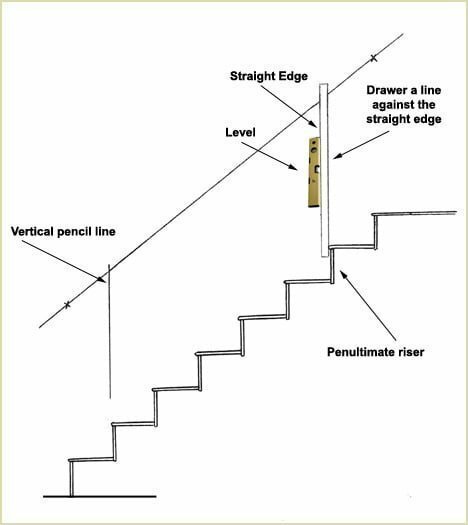 Place the first bracket against the wall with the centre line of the bracket against the vertical line and the handrail plate along the handrail pencil line. Mark the three holes with a bradle and then remove the bracket. Repeat this process for the remaining three brackets. Please Note: Make sure you have a secure fixing so that the rail is strong enough to fall against. 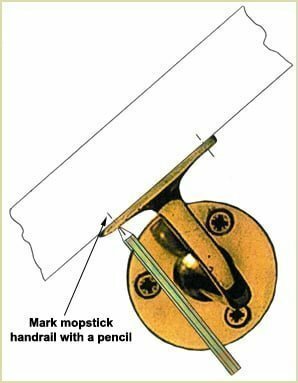 With the help of another person put the mopstick handrail on the brackets and mark with a pencil the mopstick handrail plate holes. 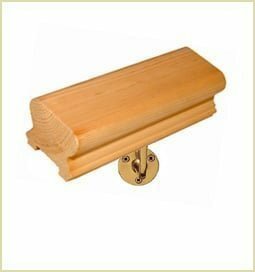 This enables you to take the handrail off and pre-drill the wood. 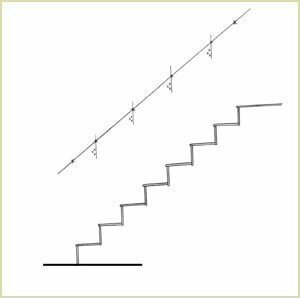 Pear Stairs always recommend you pre-drill all screw holes into timber so that you do not have any split timber. Fit the handrail temporarily so that you can mark the ends of the mopstick handrail to enjoy a more attractive finish. 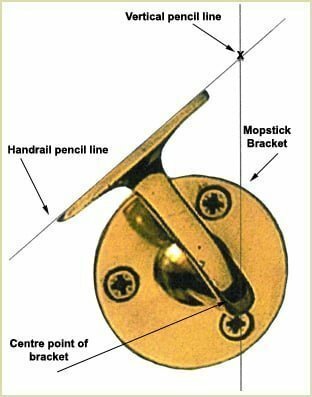 Now finally fix your mopstick handrail back into position for a finished handrail. You just need to paint or stain the handrail. 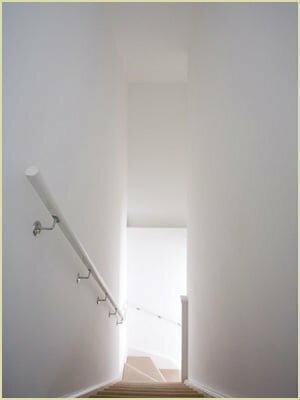 Pear Stairs sell wall mounted handrails in all shapes and sizes, but remember if you have any questions, don't hesitate to phone us about your wall mounted handrail choice. We are a very friendly company, phone Pear Stairs on 01938 553311.